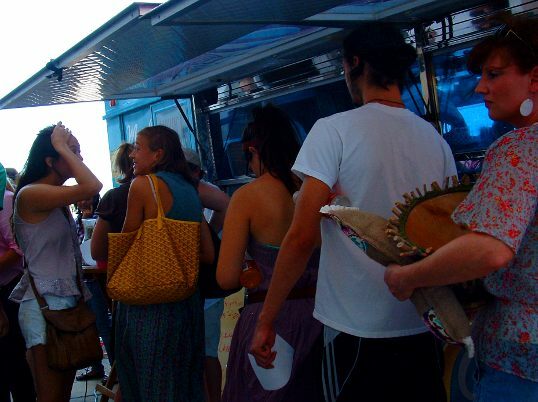 I have this continuing fascination with Food Trucks. 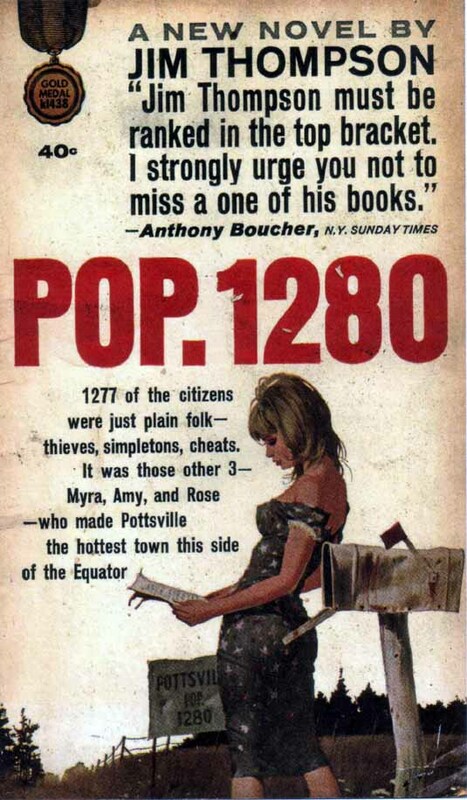 One of the interesting aspects is the battle with City Hall and the struggle for permitting and permission. You would think that you could drive where you wanted and sell sandwiches. Nope. Even when the city likes something, it sets up barriers. And charges fees. Why does the Good Life End? Redistribution of wealth rather than emphasis on its creation is surely a symptom of aging societies. What Should I Do with the Cables, CDs, and Accessories that Come with My Gadgets? My camera is fixed! 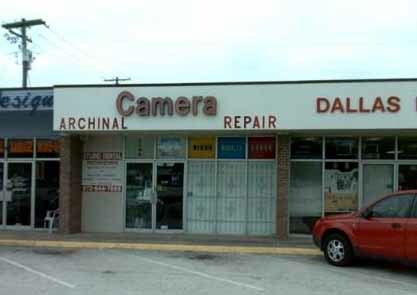 If you need repairs or other work on your digital cameras – I highly recommend Archinal Camera Repair. It is located in an old storefront in old Downtown Richardson. It isn’t cheap – repairing complex electronics and delicate mechanical devices never is – but they do good work and are pleasant to deal with. Do you remember this song from “Kill Bill”? It was originally done by Cher, and was written by Sonny Bono. I remember when each and every building in the Dallas Arts District went up – starting decades ago when I worked downtown and they built the Art Museum and I’d sit in the sculpture garden and eat my paper sack sandwich lunch (it was free back then, believe it or not). Then the Symphony hall, and the Nasher. Finally, the completion of the district with the Opera House and the Wyly theater (there is still one more theater under construction). I love the area and hope that Dallas can make it into the vibrant urban spot they want. So far, it’s a beautiful but usually desolate destination. It hasn’t reached the tipping point where the vast population out in the suburbs think of downtown as a place to go – but the city is working on it. One fact that I was definitely wrong on is that, as much as I loved the Wyly as architecture, I was afraid I’d never be able to actually go to the thing. It felt like a gift to the wealthy, a plaything for the rich, and the poor proles like myself, the workin stiffs, would never be able to afford to visit. I was mistaken. I read that the Dallas Theater Center was producing The Tempest at the Wyly and I surfed over to check out the price. It cost about what a 3D movie is going for. Well, I love me some Shakespeare, so I clicked on to a Tuesday night and bought a couple tickets. 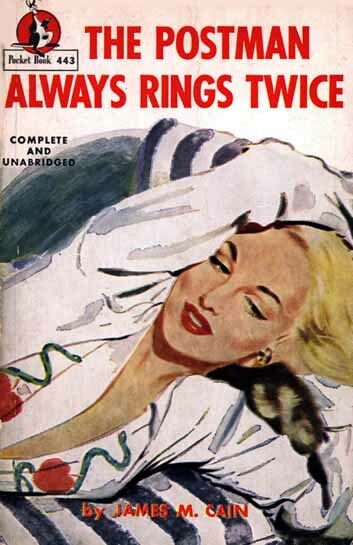 I was as interested in the theater itself as the play, so I bought the cheapest seats – up in the nosebleed section. I was excited to actually see the thing in action. Oh, and I love “The Tempest” too. We rode the DART train downtown to the Pearl Station and walked over to the Wyly. You descend down a ramp to the main entrance which is beneath the building itself. Then you ride an elevator up to the seats. We were in the cheap seats – but they were still great. We were looking down onto the stage from a short distance away – I can’t say these were any worse than the premium seats (only a few dollars more, actually) below us. 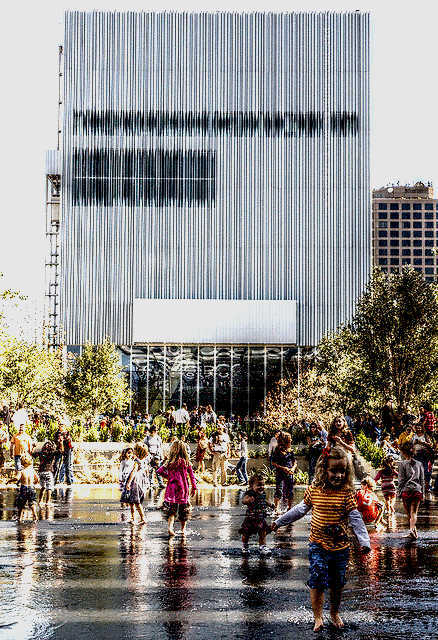 Kids Splashing in front of the Wyly Theater. An HDR image I took on the opening day of the theater. This was a pared-down version of The Tempest which let the skills of the actors shine through. Still, there was plenty of clever stagecraft – a terrifying plane crash in the beginning (with the rows of seats tumbling down through a hole in the floor) – a character emerging from beneath the earth through a crack in the chalky island soil, and a terrifying spirit descending from above to deliver the message of doom. The production was gorgeous to look at. One nice touch was that the lighting would subtly change whenever a character would deliver a soliloquy or aside. It was an effective way of signaling what was going on. All modern Shakespeare productions, especially The Tempest, are modified to some extent. At first, I thought they had simplified the language, because I understood it so much better than I usually did. After a while, I realised that the text was the same, it was simply that the acoustics are so good in the Wyly that I could hear the actors like crystal. Greatness! Oh brave new world that has such people in’t. In my opinion, a production of The Tempest rises or falls on Ariel. Can the Actor/Actress (I’ve seen both… about 50/50) make a believable sprite? Can they be light as a breeze when needed while as powerful and terrifying as a storm? This production had a local actor that has made it on Broadway, Hunter Ryan Herdlicka … and he did a great job. They were able to use his singing voice as a powerful tool to move the drama along – too often I’ve seen the songs in The Tempest be more of a distraction than an effective part of the play. So, I went down there to see the theater, and I was not disappointed. And I came away impressed with the production, I really enjoyed it… and after all, the play’s the thing (oops, wrong Shakespeare play). Mercy itself, and frees all faults. 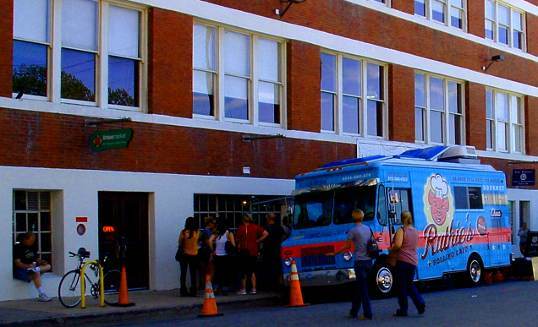 I felt like another food truck, so checking the schedules, I found that Ruthie’s Rolling Cafe was serving lunch down at a flea market at Southside on Lamar – so off I went. Southside is an odd sort of place. It is a modern urban development constructed out of an old massive Sears Warehouse just south of Downtown Dallas. Like a lot of new developments here, it is teetering on the edge of a critical mass – people, money, entertainment, shopping. So far, so good. I’d like to live there if I could afford it. 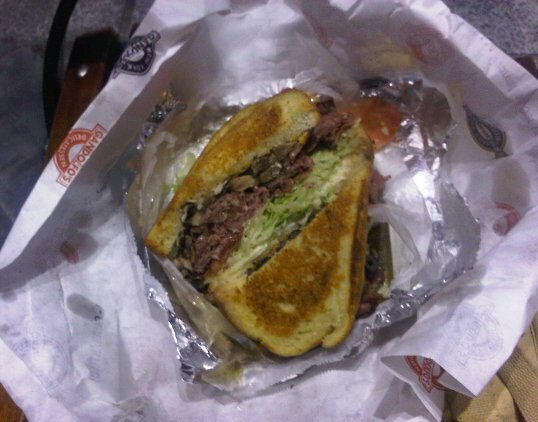 I had seen Ruthie’s before, it was next to the SsahmBBQ truck down in the arts district when I had some Kimchee Fries. 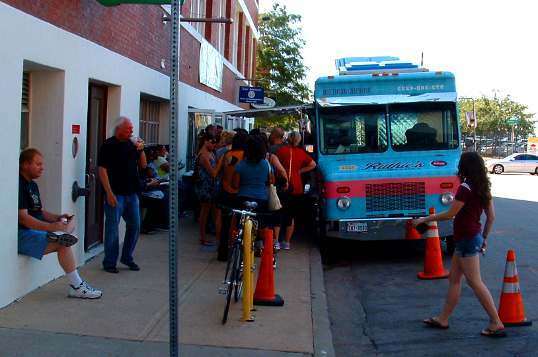 The Ruthie’s truck looked inviting, even though I chose the Korean BBQ tacos for the evening. I was glad to finally get to check the chow out. The truck was parked on the street right up against the red brick of the old warehouse. There was a big crowd waiting in line. A lot of folks were down there for the flea market and the truck was an irresistible draw. They were already running low on raw materials – no chicken, Turkey, or cheddar cheese. To make things go quicker, the line passed down a pad and some markers, so you could fill out your choice while you waited. It all looked good. The Secret Slob Sauce looked irresistible – plus they were passing around a plastic ramekin of the stuff along with a bit of chips… so you could check it out. The wait went quickly, the sandwich was delicious. Folks waiting in line… some with flea market crap they had bought. Everybody was friendly and chatting. They were playing classic oldies rock – the young guy taking orders asked me if I liked Boston (“More than a Feeling” was blaring out of the speakers). He said he had seen Boston and Styx not too long ago and it was, “The best concert I had ever seen.” I told him I thought I’d seen Boston and Styx in nineteen seventy eight – more than thirty years ago. Now that I think about it… it was Styx with Rick Derringer, Steve Miller and Frampton that I actually saw. Jesus, that was a long time ago. 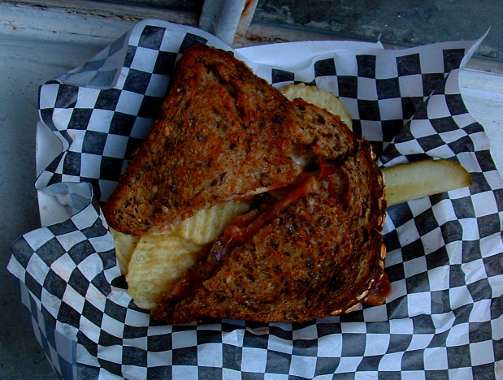 The big question with a food truck is where do you chomp down your grub? The Southside Building had recessed windows along the sidewalk where you could sit and scarf. All very fun. Saturday was the Smithsonian Magazine Museum Day and I spent some time Friday evening scrolling up and down the list of Metroplex repositories of artifacts. 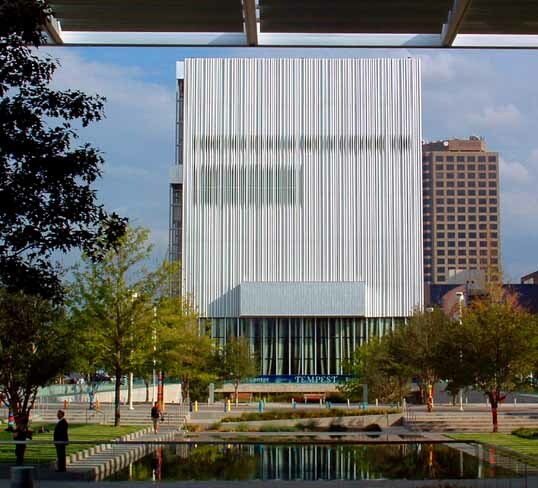 Fort Worth Modern Art Museum? A great idea, but too far away. Nasher? Been there a lot lately, plus my favorite piece is closd. Women’s Museum?, Discovery Gardens?, International Museum of Cultures? Nah…. 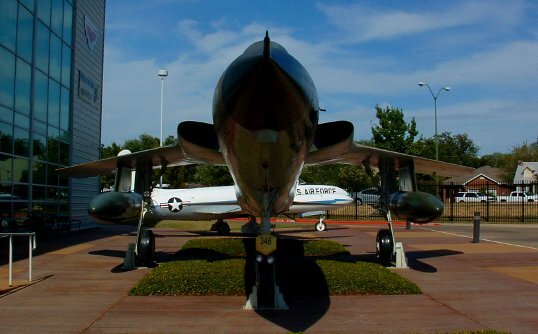 But there is an aircraft museum, The Frontiers of Flight Museum at Love Field. I’ve always been fascinated by airplanes (who isn’t?) and I drive by the place all the time. That’s the ticket. 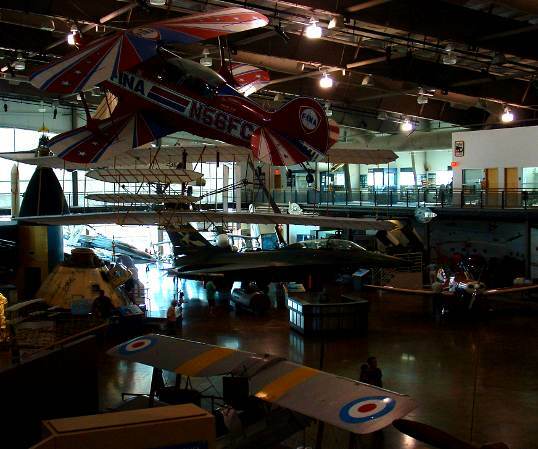 The Frontiers of Flight Museum is not a huge place – but it has a nice collection. A wide variety of cool aircraft and interesting displays. The main display area is crowded with craft - from a Wright Brothers' Flyer in the center to a Sopwith Camel, an F16, to the Apollo 7 Capsule. 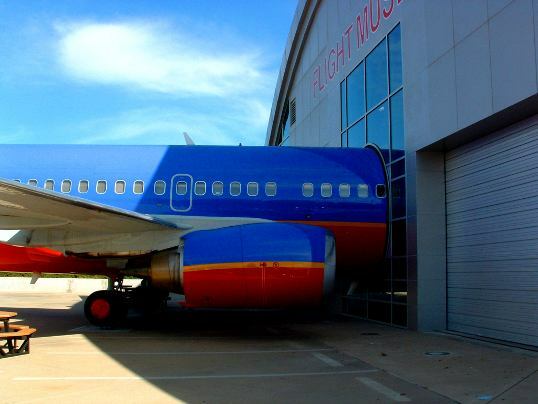 I drive by this all the time - a Southwest Airlines Jet looks like it ran into the building. You can tour the plane from the inside... the kids especially like that. They have a few planes on display outside. There is a new section with several rooms designed for kids’ birthday parties and a big play area – bounce house, play equipment, and – coolest of all – a tall climbing structure with an enclosed area fifteen feet up in the air glassed-in to look like a control tower. They had little toy planes circling overhead on the ends of rotating poles. The kids inside there were having a blast. Why didn’t they have stuff like that when I was a kid? A lot of the displays concerned the history of Love Field and the commercial airlines, especially Southwest Airlines, that have flown out of there. 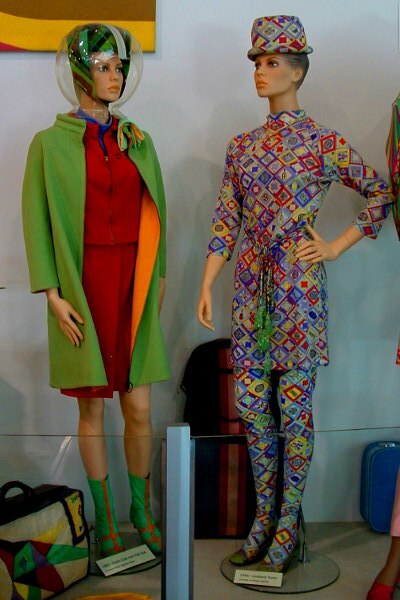 One thing that was unexpectedly fascinating were the displays of Stewardess fashions over the decades. 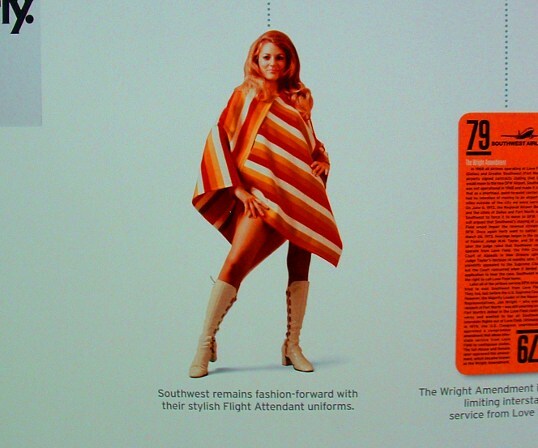 In its early days Southwest Airlines was famous for strange Stewardess fashions. Can you imagine someone dressed like this bringing you a fresh barf bag? Those were the days when commercial flying was something special. Now it’s a crappy, high speed, cattle car. 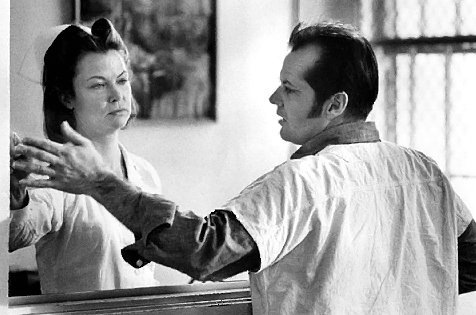 There are no more Stewardesses – now we have flight attendants… I think of Nurse Ratched with a cattle prod. 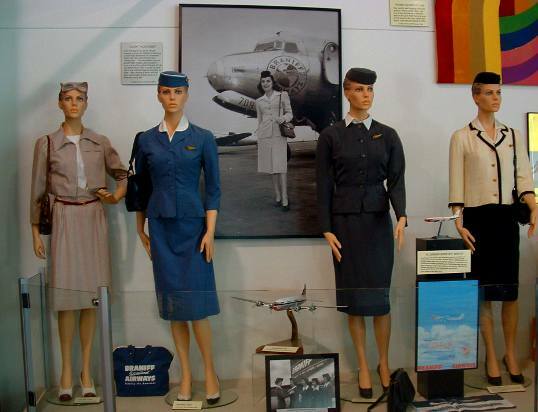 These mannequins are wearing uniforms from the thirties on up through the fifties. Looks pretty normal, doesn’t it? A little stuffy and a bit dated – but someone dressed like this would not look too much out of place today. However, in the sixties…. Everybody obviously lost their collective minds. I remember those days… this was considered modern and fashionable. There was one area of the museum that I was not expecting and that meant something to me. 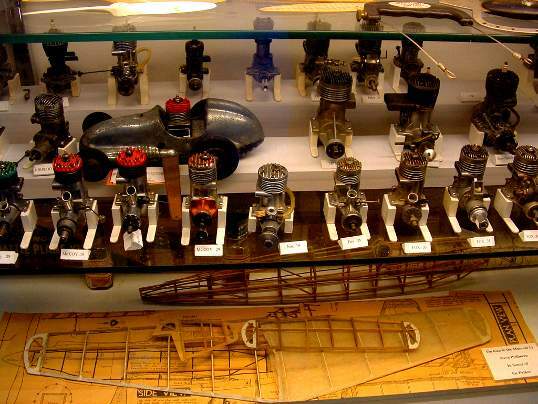 They had a room set up full of model airplanes – both finished and under construction. When I was a little kid I loved to build balsa models. It’s something I still miss. There is a smell and feel that goes along with balsa wood. 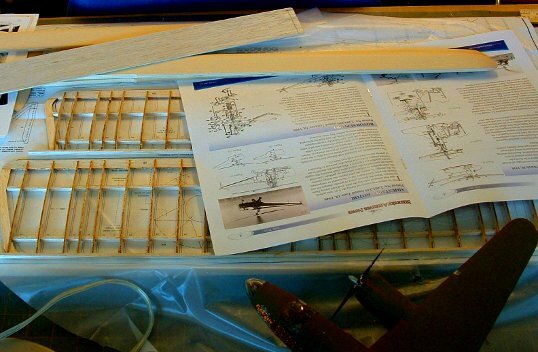 Those die cut bulkheads, balsa stringers, and paper… coming together with some glue and paint to make a little airplane – light and delicate. To see these models half built, spread out across the tables… such memories. 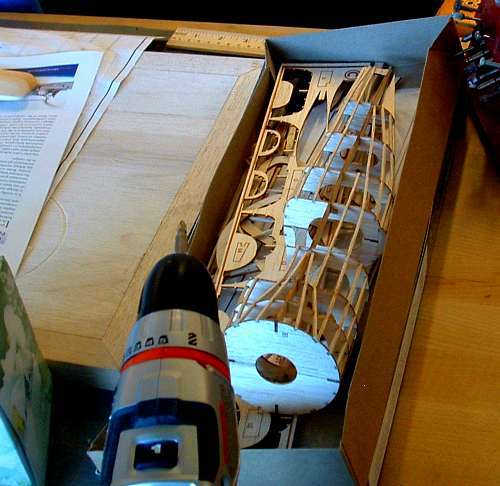 The wings with their curved airfoil ribs, carefully carved out with an x-acto knife and pinned out on plans stretched across a pine board. 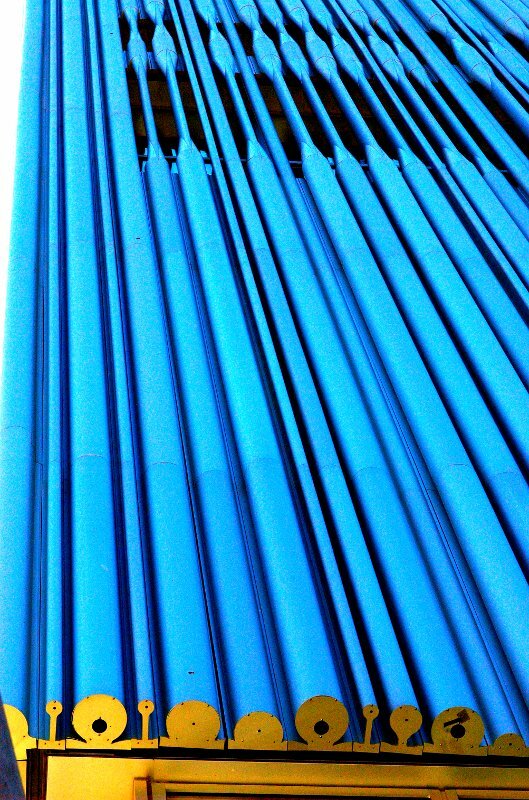 The stringers, struts, and spars slide in – and then it is all covered. I used to like to build gliders – mostly because I couldn’t afford to buy the little gas motors. They are amazing little machines – the tiny screaming powerplants, belching castor oil and alcohol. And that’s what a museum is really about isn’t it. A preservation of memories… sometimes yours, sometimes other peoples’. It was Friday and I finished up working late. I had no plans, but I wanted to find something to do, anything. But the sun was getting ready to set so I didn’t have time to find my bicycle and go for a ride. 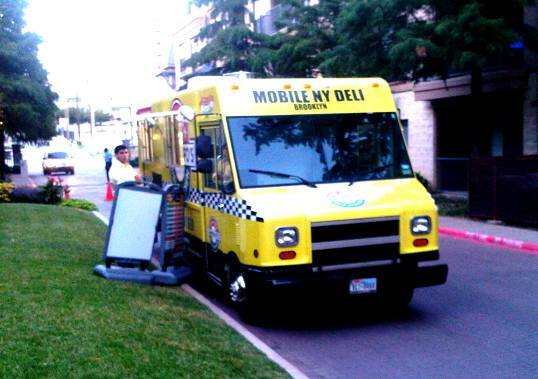 Checking online to see if there was a Food Truck somewhere, I discovered that Gandolfo’s New York Deli Dallas truck was pulling in to some apartment complex just north of Downtown Dallas. I had never eaten from that truck so I decided to make it a go. Instead of going home and changing, I simply hopped the DART train next to my work and went downtown, using my phone GPS to find my way around. I wanted some fresh cash so I hunted around for an ATM – and discovered from the Internet search comments there was only one ATM from my bank in downtown Dallas that wasn’t inside a giant skyscraper. It was a tough walk through the canyons between the glass towers. The bank branch was a drive-through, and I patiently waited on foot behind some guy in a convertible and in front of a couple in a BMW to get my cash. Then I hoofed it north out of downtown and found the apartments. The Food Truck was inside the complex – but I walked past the security guard, asking him, “Hey are those sandwiches from the truck any good?” – he said yes and let me through. While I was waiting, some woman drove up and asked, “Hey, what’s up with this?” I explained it was a food truck, and this one was a Deli on wheels, that their sandwiches looked really good. 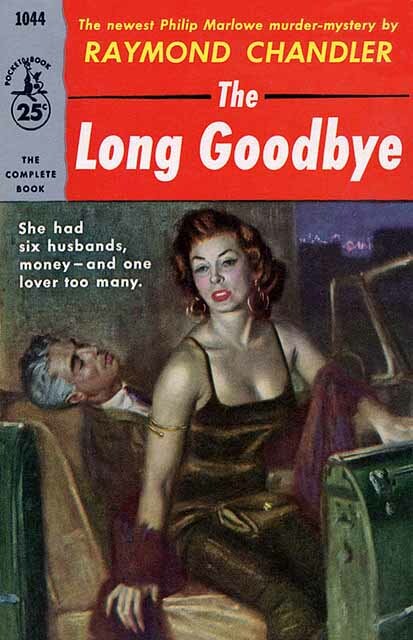 “Oh, yeah, I’ll give it a try,” she said and turned into the parking garage. 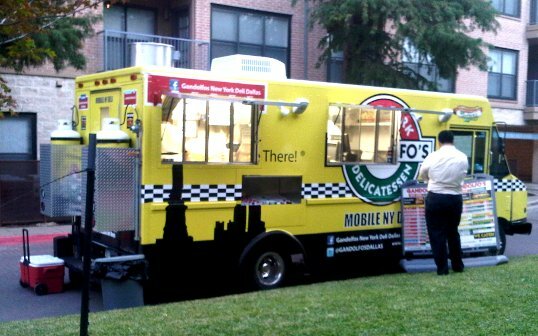 Gandolfo's food truck inside the apartment complex. Now my problem was finding a place to sit down and eat the damn thing. The apartment complex had some little nooks with benches or tables, but I don’t live there, felt a little uncomfortable, and wanted to find someplace else. Once I hit the streets, walking back toward the train platforms, I remembered that downtown Dallas is not a very pedestrian friendly place. It is a city of heavy traffic, massive buildings, and underground malls – the surface is not inviting to mere humans. As I walked I could see a few hapless confused tourists out on the sidewalks looking for something to do. Once the sun sets and the security goes up – it’s pretty damn barren down there. I did remember the fountains around the bottom of I. M. Pei’s giant glass prism of Fountain Place. There is a cool programmable fountain set in an artificial grove of bald cypress trees that I’ve always liked.That spot, the massive building cantilevered out overhead, water running in burbling, professionally designed paths, and the complex patterned programming of the fountain jets foaming up out of the holes in the granite, lit at night by careful variable fiber optics – has always represented the best of the big city to me. A planned, programmed respite from the hustle and bustle. It was a good sweaty walk from where I was, but I decided to hoof it anyway. Once I reached my goal I discovered a velvet rope up across the entrance with a sign that said, “Closed, Private Wedding.” There wasn’t anybody inside yet and I was sorely tempted to hop in anyway, but thought better of it. I know it technically isn’t a “public space” but all I wanted was to sit down for a minute and eat my sandwich in peace. I hope their marriage ends in tears. So I walked around the building and found a bench along the sidewalk, sat down and ate my sandwich. 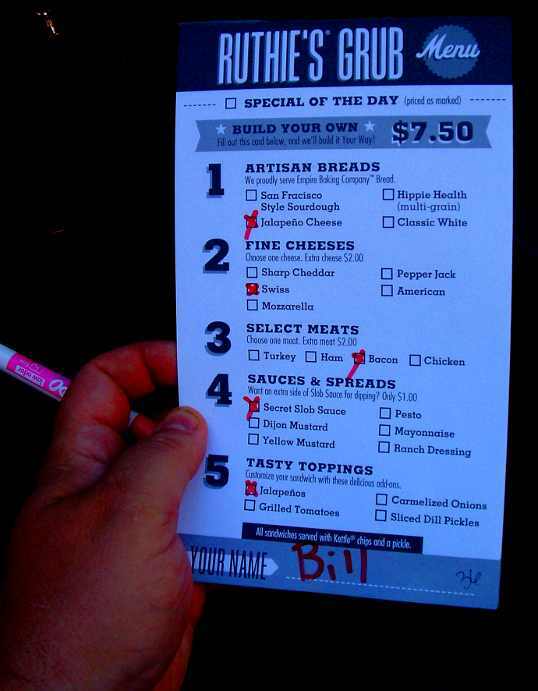 It was pretty darn good – and the guy was right, I needed the fork to get it all. My knuckle sandwich. It was very good and I had to use a fork to get all of it. There wasn’t much left to do, so I rode the train back out to my car. Nighttime falls quickly and public transportation in the dark fills up with a varied and motley lot. It would be good people watching, except that you are watching people that, along with you, have been trapped and sealed up in a hurtling giant cramped metal tube propelled by overhead cables of high-voltage current. After a while, you look around at the homeless crackheads, the sullen alcoholics, the innervated drunks, the clots of gang bangers trying to keep their pants up, lost souls on the way to a party, any party, anywhere, bottom rung workers trying to keep their dignity and eyes open on the way home after a long, long day… you look around and think, hey, I’m here too. Such is life in the big city. The thing about photography is that, especially now, everybody has a camera. Everybody is always taking pictures. How do you capture something different than everbody else? I was in the Dallas Arts District and taking a picture of the Wylie Theater. Everybody in the picture had a camera. Think photographs should be provocative and not tell you what you already know. It takes no great powers or magic to reproduce somebody’s face in a photograph. The magic is in seeing people in new ways. The Wylie Theater. 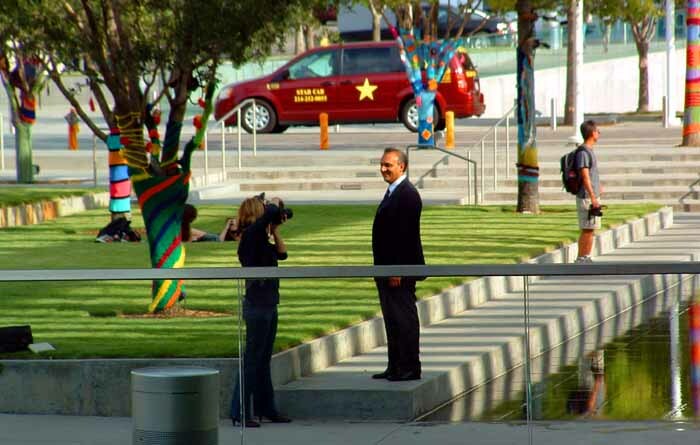 Down in the lower left, a woman is photographing a man. I noticed a guy walking around the reflecting pool with a big camera and a woman doing a photo shoot . Nothing happens when you sit at home. I always make it a point to carry a camera with me at all times…I just shoot at what interests me at that moment. I have no idea who this guy is or why he is getting his photo done. I think the best pictures are often on the edges of any situation, I don’t find photographing the situation nearly as interesting as photographing the edges. All photographs are there to remind us of what we forget. In this – as in other ways – they are the opposite of paintings. Paintings record what the painter remembers. Because each one of us forgets different things, a photo more than a painting may change its meaning according to who is looking at it. On Sundays I try to make up some lunches to pack up so I can take them to work the next week, something I can nuke, and save a smidgen of money over eating lunch out. Inspired by the Kimchee Fries I had from the SsahmBBQ Food Truck I decided to do something with Kimchi. 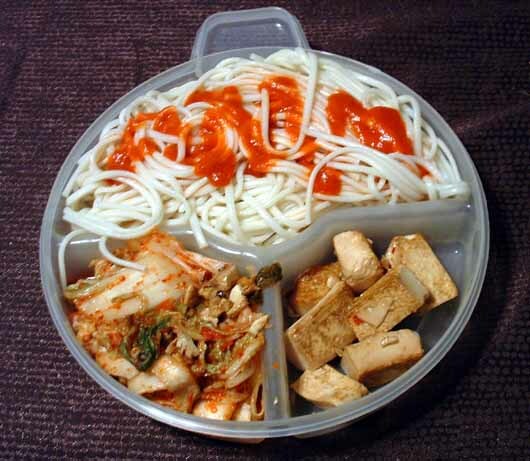 Instead of fries, I thought I’d have them with Tofu and Udon noodles (I love the big, pfat udon). Low on raw materials, I headed out to Saigon Mall, the Asian grocery store (and more) near our house. I go there a lot – though not as often as I’d like. It’s like taking a little exotic vacation for the cost of a meal, smoothie, or a bag of groceries. 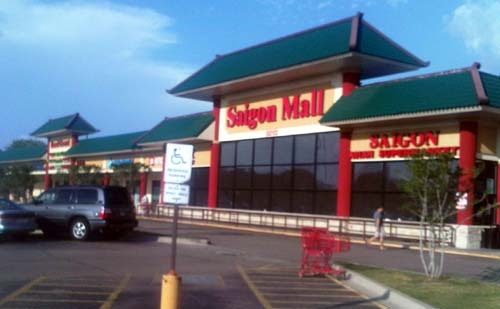 Saigon Mall, about a half-mile from my house. This used to be the neighborhood Target store. I was low on Udon, so I bought a package. Saigon Mall has two entire aisles plus a refrigerated section dedicated to noodles in all their varied glory. I’ve tried several brands, and decided that I like the Hoshi Maru Udon the best. When you buy noodles from Saigon Mall the receipt always says “Alimentary Paste” on it. I thought that was some sort of mistranslation until I did a tiny bit of research where I discovered that this was something our government, in all its wisdom, required. The Hosi Maru Udon package has the words “Elementary Pasta” written on it. I’m not sure if that is a derivative of “alimentary paste” or not. Luckily I’ve never seen it transposed as “Elementary Paste” – that sounds like what we all ate in third grade. They had ready-made Kimchi in refrigerated glass bottles. The small quart size said “Kimchi” on it… the big gallons said “MocKimchi.” I don’t know if there is a difference, but as far as I could see the stuff in the jar looked identical. I’m not quite up to buying the gallon size jar of fermented cabbage yet, so I stuck with the quart. 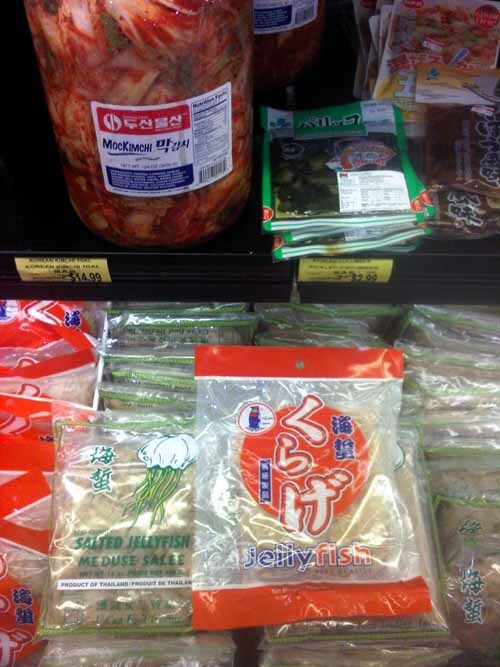 The Kimchi is in the refrigerated case, right next to the jellyfish section. The store has a mind-boggling selection of sauces. 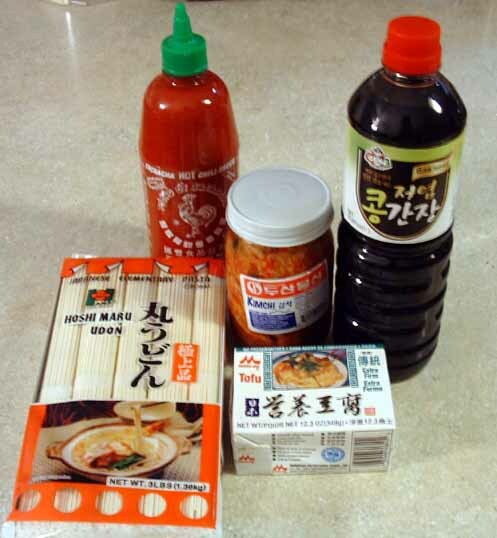 I chose an inexpensive soy sauce pretty much at random and bought a big bottle of Sriracha brand Rooster sauce. A package of firm tofu… and I had my raw ingredients. I sautéed slices of the tofu in a pan until they were a little brown, then cooked some soy sauce with them until it reduced. Meanwhile, I boiled up a mess of udon. I opened the jar of Kimchi and watched the spicy, fermented cabbage bubble and burp (I guess this is how you know it’s good kimchi) before I dumped it out. When all this was done, I divided it all up into four meals, then squirted Sriracha over the noodles for flavor and kick. They are packaged apart, but I’ll eat it all together, mixed in a bowl. A pretty good lunch, actually.